"What news have you heard from the war, Irnskar?" 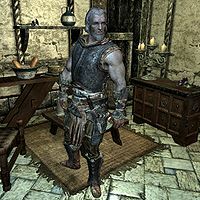 Irnskar Ironhand is a Nord warrior who lives in Solitude where he acts as Thane Bryling's personal protector. He is owed a substantial gambling debt by Octieve San, an old Breton who also lives in Solitude. During the related quest, you will have to settle things for Octieve San. Irnskar lives a busy life in Solitude, although not exactly as intended (see bugs). He sleeps in Bryling's House between midnight and 8am. He then spends the entire day inside the house, and only ventures outside on two occasions; at 10am he visits Radiant Raiment for two hours, and at 2pm he visits Solitude Blacksmith, also for two hours. Irnskar wears a set of iron armor, boots, and gauntlets. He carries a belted tunic, an iron dagger, a key to Bryling's house, and a selection of lower-class items and gold. When you approach him, he will say: "Unless we have specific business, I'm not interested." He will also tell you: "When I was a young rascal, I broke a man's arm with a single punch. Course, I had a horseshoe hidden in my glove..." Due to the bug in his schedule, his other greeting can only be heard when Bryling is at home between 8pm and midnight: "I think Bryling's the one you want to talk to. I'm mostly just here to scare away the riff raff". If Bryling is dead, he will replace her (at least temporarily) as thane, and will greet you with: "You don't want to talk to me. I'm just a stand in for a dead Thane." Bryling: "What news have you heard from the war, Irnskar?" Irnskar: "You won't like it, my lady." Bryling: "I'm well aware that I won't like it. But it's my duty to keep my people safe. Tell me." Irnskar: "Possession of the holds change on an almost daily basis, but I can report that Haafingar is still secure. Your people are safe." Bryling: "I'm not just talking about my subjects. 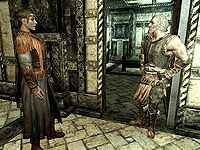 I'm talking about my people: the proud Nords of Skyrim." Irnskar: "I told you you wouldn't like the news." "He's an old man. Let it go." (Persuade) Passed: "Fine. You sound like a priest of Mara, but I get your point. Tell him to forget about the gold." Failed: "A debt. Is a debt." "What if I pay it?" (Bribe) Passed: "Works for me. Tell Octieve the debt's settled." "Lay off the old man. Now." (Intimidate) Passed: "All right, all right. Have it your way. Tell Octieve to forget about the debt." "Final warning. Leave Octieve alone." "All right. Tell the old man his debts are settled." "Fine. Forget I asked." "That's what I thought." Irnskar was supposed to keep watch in the lobby of the Blue Palace from 8am to 8pm, but an oversight in his SolitudePalaceLobbySandbox8x12 package prevents it from activating, thus keeping him in the house all day long. This page was last modified on 9 August 2016, at 17:29.